Sidewalk Envy: The Year of the Metal Rabbit, Or It's New Year's All Over Again! 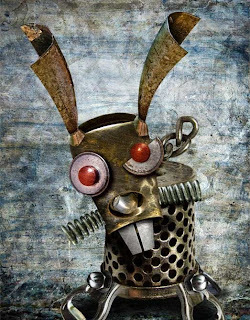 The Year of the Metal Rabbit, Or It's New Year's All Over Again! Seems like it was just a few weeks ago that I penned my resolutions for the New Year. Hardly got to them and it's time to start all over. I don't profess to know a lot about the traditions or celebrations that surround the Chinese New Year. However, I have checked out Chinese Astrology over the years and I do know that I was born in the year of the Metal Rabbit. Turns out that this year is also a Metal Rabbit New Year, so this should be a really good one for me. My resolution is not to buy a rabbit. We had rabbits when the boys were young. It was one of those, "Please, please, I'll take good care of them," deals. Suffice it to say, besides that fact that I think I was the only person who fed, cleaned and talked to them, it was not a good experience. 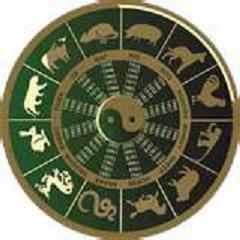 * The 12 animal years are the Rat, Ox, Tiger, Rabbit, Dragon, Snake, Horse, Goat, Monkey, Rooster, Dog and Pig. As mentioned, we did the rabbit thing, and had a dog...we once rented from a couple who had the ox, horse, goat, rooster and pig! There were snakes and rats around the property, as it was a former farm, I guess I could say the boys were "little monkeys" when they were young...that just leaves the dragon, so maybe I'll work on getting one of those as a New Year goal. I'm thinking something carved, not a real one that will then have me upping my fire insurance limits. 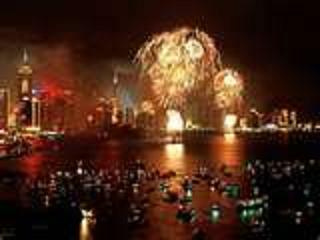 * Records for the traditional Chinese calendar go back to at least 14th Century BCE. * Food and a family feast are the most important aspects of the holiday. The entire family gathers on New Year's Eve to eat a huge meal all night long. Eating long noodles is a sign of longevity as the noodles aren't cut. Serving a fish as the final course is symbolic of prosperity and the fish is not eaten. I like to eat. Besides the point that it's integral to surviving, it would be nice to say that I'm eating a huge meal as it's a resolution for the New Year...sort of makes it a "must do." Nobody argues with you when you're fulfilling your resolutions! Resolve to celebrate each and every day. * The original Chinese New Year celebration lasted 15 days. Many cities and business still celebrate for that long and workers get a week off to observe the holiday. A week off? The Irish never came up with anything like that...possible resolution, convert! * The color red symbolizes many things in China. 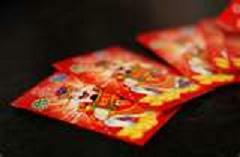 For New Year celebrations a red envelope containing money is given to young people to guarantee prosperity. Anyone who has a job or is married gives money to someone younger and isn't working. This one is sort of a recall resolution. We've been giving money to our boys for years, even after they've been working. Seems like they accept it in any color envelope...actually, they'll just let you toss it to them. Resolution, give boys money in red envelopes. Resolution part 2, don't buy red envelopes! * Moon cakes are traditional foods served on the final day of the celebration at the full moon. They are round, white dumplings which symbolize completeness and wholeness of the family. Might have gone wrong here, too. My moon cakes are half moon cakes, black and white frosting on chocolate cake (you might remember a recent post of mine). Maybe that's why I only get halfway with my resolutions! Oh well, here's a little bit about being a Rabbit, Chinese-astrology-wise. You'll see that there are different types...I'd wouldn't want to be a Water Rabbit, I hate being the least bit damp and, from experience, I know that after a good rain they smell bad. The holiday includes fireworks! Resolution, buy fireworks to have on hand for holidays. Although, with my family, forgetting any holiday or celebration, most times just getting together results in fireworks! Now that I think of it, it's illegal for me to buy and use fireworks, so back to the family thing. Resolution, be sure to invite family members who will create fireworks! Oh, and, Happy New Year, again! Phil, wow, now I get it. Explains the ring in your nose thing and why you are always pulling that little red wagon behind you!